Welcome to Oak Grove Baptist Church, a great place to raise a family or to become a part of one. We are proud that you have chosen to visit our website. 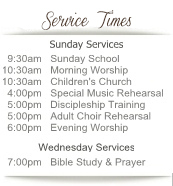 We pray that you will be our guest this Sunday. Oak Grove Baptist Church exists to exalt the Lord Jesus Christ, promote the Gospel to those without hope, and provide support for believers as they continue in their pilgrimage as a Christian. We believe the Bible is God's Word, Jesus is God's Son and the only way of salvation, and that we are called as a body of believer's to worship, serve, and honor Him in all that we do. Without grace and mercy, mankind stands condemned as a result of an inherent sinful nature. We welcome all who are searching for a place of peace in their lives.